SMI clients in the Tidewater area since per diem expense rates will be the same as those charged in the Tampa Bay area. Series 300 Pedestal Cranes is con- tained in a new brochure now available from the Skagit Divi- sion of Continental Emsco Com- pany, Sedro-Woolley, Wash. The 10-page, four-color liter- ature describes the various sys- tems, controls, components and optional equipment that make these cranes ideal for offshore operations. Included are details on Skagit's high-performance hydraulic sys- tem and tne extra smooth swing system. Information on the big performance lattice boom with its maximum 120-foot reach is given and accompanied by a work range diagram. Also presented are data on the cranes' modular design for ease of servicing, the testing program that was conducted, available crane options, and Skagit's parts and service backup. For a copy of "Pulling for you . . . with an offshore lift ca- pability,"
York City on October 28 this year will feature an impressive slate of speakers and panelists. The one-day seminar will explore the managerial and financial evalua- tion of preventive maintenance expenditures and their relation- ship to utilization of assets and the effect on the "bottom line." The speakers and panelists will discuss the critical decision-mak- ing path leading up to the for- mulation of a corporate preven- tive maintenance philosophy and resultant expenditures. In addi- tion, there will be a panel session that will examine the systems and techniques currently avail- able for condition monitoring. York, N.Y.; telephone (212) 425- 4345. Some clear thinking on why the navies of ninety countries rely on Decca electronics. Operations room of the new Brazilian frigate 'Niteroi. 'with Decca special displays and E W console. Radar picture before and after improvement by Decca Clearscan videoprocessing. 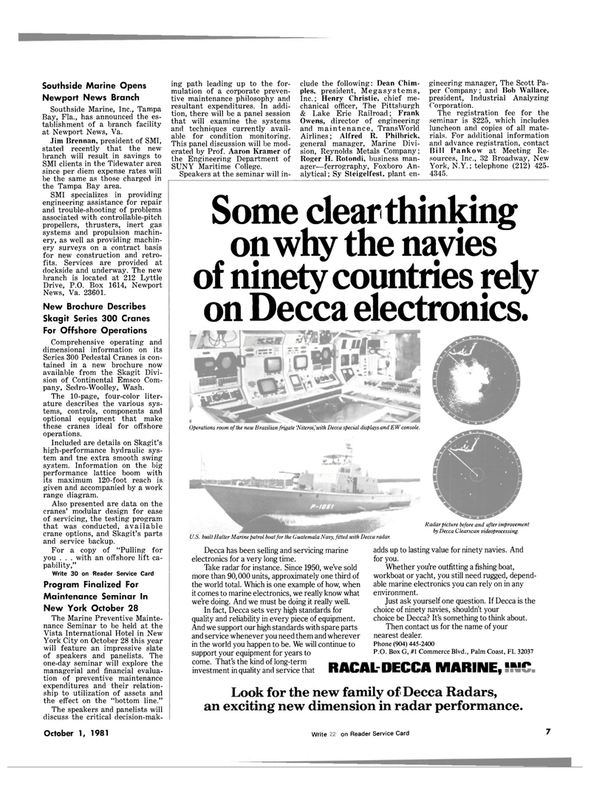 Decca has been selling and servicing marine electronics for a very long time. Take radar for instance. Since 1950, we've sold more than 90,000 units, approximately one third of the world total. Which is one example of how, when it comes to marine electronics, we really know what we're doing. And we must be doing it really well. In fact, Decca sets very high standards for quality and reliability in every piece of equipment. Look for the new family of Decca Radars, an exciting new dimension in radar performance. adds up to lasting value for ninety navies. And for you. Whether you're outfitting a fishing boat, workboat or yacht, you still need rugged, depend- able marine electronics you can rely on in any environment. Just ask yourself one question. If Decca is the choice of ninety navies, shouldn't your choice be Decca? It's something to think about. Then contact us for the name of your nearest dealer. U.S. built Hatter Marine patrol boat for the Guatemala Navy, fitted with Decca radar.